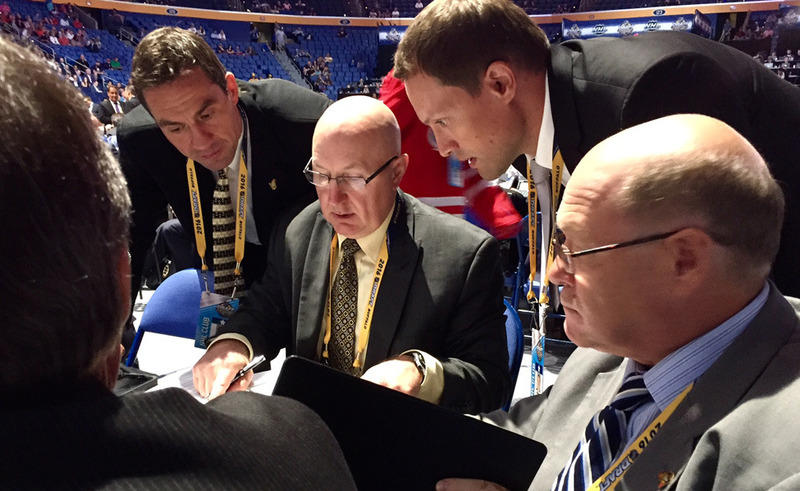 With the 2016 NHL Draft in the books we ask our scouting staff about the #Sens' 5-player haul. We obviously had him a little higher on our list and we had to extensively about him at our meetings. He's a really intriguing prospect just based on his size and skill. The Ottawa connection is nice but it's not the be all end all. That's a bonus. He has a good pedigree and we really felt his game in the second half of the year really came on. He had a great playoff with Windsor and what really solidified it for us was his under-18 tournament with the US. He was one of the best players in the tournament so you get a 6'6" centre with skill who still has a lot of room for growth it's exciting. We're real excited. We had him ranked in the first round/early second and we were hoping that'd we get him at #42. He's a guy that we talked about a lot in our meetings. Obviously his dad played in the NHL so he has some good pedigree. He's a skilled forward with good hockey sense and is really raw still physically. He just needs time to mature but we feel he has really good upside to be a top 9 skilled forward in the NHL. He's going to play in Timra in Sweden. He feels comfortable playing there and I think it will be good for his development this year. He'll probably play on the Swedish World Junior team so he'll have a good year of development over there. Todd Burgess is 6'3" skilled centre who is a late developer. He cracked his kneecap when he first went in to the North American Hockey League so that set him back probably less than a year. He came back with a vengence last year and had 100 points and his team in Fairbanks won the league championship. He still needs strength. He's a lean kid and I think last time I talked to him he was 182 lbs. I met the kid and he hasn't even shaved yet but his dad is a big man. His dad is 6'4", 230 lbs so that's more of a projection on him. He's going to RPI so he's a collegiate player. Maxime is a very good skater and puck-mover who has a good head on his shoulders. He was injured last year and had mono so he was setback a little bit and missed some time. He also lost some weight and had trouble putting it back on. I think he'll need maybe two more years in junior and then maybe spend some time in the minors. It'll be a little longer of a process but he's got some good assets to work with. Get to know #Sens fifth-round pick Maxime Lajoie. He's a big, raw, hard-working kid who has some skill and is good around the net. It'll be interesting to see where he's going to end up be he has the tools. He's a long-term project who's very raw. He's an interesting kid. He's going to stay in Finland next year and he might have a chance to play elite league games but more likely junior or Division I. I think that's the plan for next year.